To insert images in your content using the CK editor, follow the below steps. Place your cursor where you want the picture to be inserted. Then click on the Insert Image icon in the toolbar. 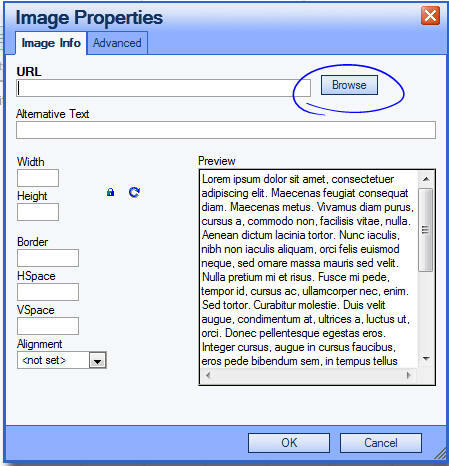 The Image Properties dialog box will appear. If the image is on a web page by itself, type in the URL. If the image is on your local disk and needs to be uploaded, click on the Browse button. a. Click on the Upload button at the top left of the popup window. b. Find and select the file from your computer. c. When the file is uploaded, it will appear at the top of the list in the popup window. Double-click on the newly uploaded file. 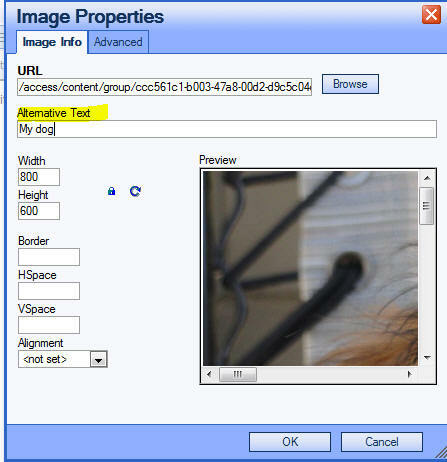 You will be returned to the Image Properties dialog box, with the URL to the image all filled in correctly. It is a very good idea to get into the habit of filling in the Alternative Text line. This should be descriptive information for screen readers to read to users with low vision. Then click on the OK button at the bottom of the page. You will be returned to your page with the image in the spot where your cursor had been set. If you upload an image with the same name as one already there (say you needed to alter it for some reason), the original will retain that name. The new image will be identified with a number like so: (1).